GOING TO PRESS THE WATCH BUTTON FOR LATER???. INSTRUCTIONS GOOD. Do you need it fast?. All will be wrapped well. This technic box was released in 1998. In box with instructions. Would be great to add to any collection. 7x Black Technic Link Chain. 1x Black Technic Link Tread. 6x Light Grey Technic Bush 1/2 Toothed Type I. 1x Light Grey Technic Brick 1x12 with Holes. 1x Red Wedge Plate 3x6 Cut Corners. This set is has quite a few pieces missing as listed below. TOP categories. (c)2017 Jadlam Racing Ltd. Sylvanian Familes. Tamiya RC Cars. Sylvanian Families. 42094 LEGO Technic Tracked Loader 827 Pieces Age 10+ New Release for 2019! MPN: 42094. Pieces: 827. LEGO Character: Not specified. Box Height: 70. During festive and sales periods this may be extended slightly. We want you to be totally satisfied with your order, so if for any reason it’s not suitable we are here to help. (Local Pick up also available from WD19. 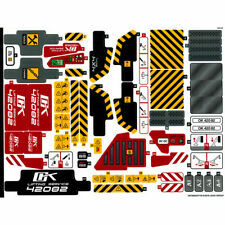 LEGO - Technic - 42028 - Bulldozer - Technology. RARE - RETIRED SET. leave with neighbour or garden shed). instructions and nominate 'safe place' in case no one is available. Lego technic front loader,put this together with online instructions. Lego Technic 42055 Instruction Booklet. New genuine Lego instructions. Another much sort after set. I WILL COMBINE. CLASSIC TECHNIC SET 8853 LOADER/DIGGER. WILL BE DISMANTLED PRIOR TO DISPATCH. LEGO MODEL 42082. THE BIGGEST CRANE TO DATE AND WILL LEFT WHEN FULLY EXTENDED. New genuine Lego. 104 black links and 4 black cogs/wheels. "International Signed" parcels cannot be sent to PO boxes except in the Middle East and Africa. International Signed. Signed For. United Kingdom. Forest Machine. A LEGO Power Functions motor and an advanced pneumatic system for a motorized boom and grabber. and grabber to lift the tree trunks, then rotate the driver's cab. a host of authentic features. REST OF THE WORLD £4.20. INSTRUCTIONS USED. LEGO Technic Motorized Bulldozer (8275). Brand new, unopened - but box is damaged (see photos). LEGO TECHNIC - 8264. "HAULER" - DISCONTINUED MODEL. PHOTOGRAPHS ARE OF ACTUAL MODEL FOR SALE. BOX DOES HAVE A COUPLE OF MINOR MARKS - OVERALL EXCELLENT CONDITION. There is no original box but it will be boxed for transport. There are no instructions although these can be found online. LEGO 42081 Technic Volvo Concept Wheel Loader Zeux. -Factory NEW condition-. This authentic replica model features articulated steering, rugged suspension and silver-colored rims with chunky tires. Then lift the included tree trunks and rotate the driver's cab to move them through more than 180°. BABY & NURSERY. 2-in-1 LEGO® Technic™ Set: rebuilds into a Tow Truck. Forklift truck features rear-wheel steering, 2-cylinder engine with moving pistons, and high-reach forks that can lift and tilt, plus a detailed driver's cab, orange warning beacon and large tyres. Lego Technic Forest Machine (42080). Condition is Used. It has only been built once then kept on display. As you can see from the pictures it looks complete and is in working order, I can’t guarantee every tiny piece is there but nothing is missing that effects it’s build or working. I have included the spares that came it’s the set. It will be taken apart for sending and placed into strong Ikea bags. Please note due to a hand injury I may not be able to take every tiny piece apart. If you have any questions please let me know. Lego Technic 42080 Forest Machine 2-in-1 Set. This authentic replica model features articulated steering, rugged suspension and silver-colored rims with chunky tires. Then lift the included tree trunks and rotate the driver's cab to move them through more than 180°. Lego Technic. Features a LEGO® Power Functions motor for an array of motorised functions, including forward and reverse driving, rotating bucket wheel, moving conveyor belts and rotating superstructure, plus a working bucket wheel boom! The instructions are in good useable condition. Lego 42030. As it's a big item, local collection only. This set has now been retired by Lego. For sale is my Lego Technic 8872-1 – Forklift Transporter – launch year 1993. The model is 100% complete but does not include the original instruction booklet or box. LEGO 42050 Technic Drag Racer Car Toy. LEGO Technic building toys are compatible with all LEGO construction sets for creative building. Compatible with LEGO Technic Power Functions Motor Set for motorised driving and wheelie functionality.